You're scrolling through your Instagram feed and what do you find? #Mealprep overload. Neatly organized, portion-sized breakfasts, lunches, snacks and dinners. Meal prep envy starts to kick in and you vow that this will be the day you start getting more prepared with your weekly meals! But where do you begin? The archaic days of meal prepping — with bland chicken, steamed broccoli and brown rice every single day — are over (thank goodness!). Enter a new age of meal prepping, where it doesn't necessarily mean pre-packaging every meal and snack. For many nutritionists, healthy food bloggers and Instagrammers, it means having the necessary ingredients prepped and ready for quick meal-time assembly. Spending a little time planning at the beginning of each week can really open up time on your schedule for friends, family, and other things you enjoy. Plus, it allows you to get healthy and creative in the kitchen, and can even help keep some cash in the bank. 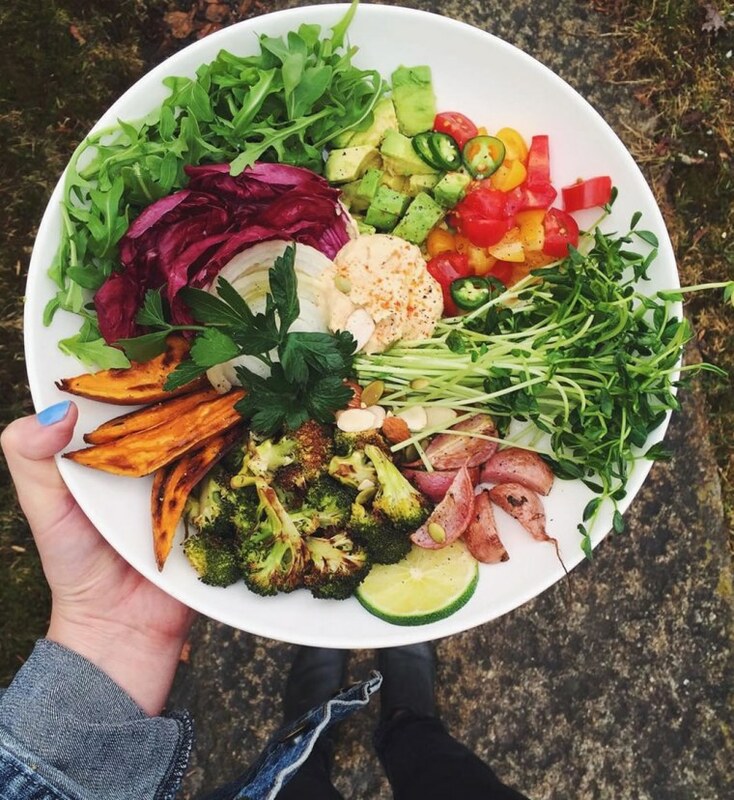 Follow these seven tips for meal prepping, from the Instagrammers who know best. Shopping lists are crucial when it comes to meal prepping because you want to be efficient at the store and while you’re actually cooking. Grouping ingredients into meals is a great method, says Carina Wolff, a health and wellness blogger. “I try to make meals that contain similar ingredients so I don't have to buy a ton of new stuff,” she says. Also, if you have the space, buying in bulk is a great option, suggests Rifkin. Having pre-cooked brown rice, quinoa and pasta on hand makes for a quick, filling base to any meal. Bases can also be a variety of greens, like arugula, spinach, sprouts and kale. Think of anything with protein or high-fiber to fill your bowl, plate or Tupperware! This will actually save you time in the long run, and prevent food items from going to waste, says Rifkin. One big tip: think of leftovers as unexpected meal prep additions. You can use leftover protein or veggies from weeknight dinners as ingredients for breakfasts and lunches the following day. For Wolff and Jennings, meal prep is split between two days in the week and takes up about two hours per prep. Scour your pantry and refrigerator and you’re bound to find a few must-have meal prep staples. “I always prep a few dips and sauces because they really brighten any meal,” says Jennings. Plus, jars of artichoke, green olives, seeds and nuts, sprouts, tinned chickpeas and beans, ginger, garlic and salsa are always great to have on-hand. “I also will always have lemon and avocado, because I love the taste of both, and they're great for flavoring any dish,” says Wolff. If you make healthy, quality food, you’re going to want to keep it in the best container possible. Glass containers, like mason jars or glass Tupperware, are more sustainable and won’t leach potentially harmful substances into your food. “It also helps keep the food tasting fresh,” says Wolff. Take going green a step further and reuse glass containers from empty pasta sauces or jarred foods. Your fridge only has so much room. Take advantage of your freezer by prepping meals and ingredients that are simple and quick to reheat on busy weeknights, like soups, sauces — even falafel, one of Jennings’ favorite things to prep. Meal prepping is your oyster. Take a bunch of your favorite foods and ingredients and have fun mixing and matching them in different ways. "The most fun part of meal prepping for me is coming up with recipe ideas! I usually browse Instagram, Pinterest and some cookbooks I have," says Wolff. Now that you’ve got that basics of meal prepping down, get Insta-inspiration from these healthy Instagrammers that meal prep like a BOSS. Swap salad dressing for black bean dip on your next salad, like Lee Tilghman of Lee From America. Paprika roasted chickpeas add a spice to a bed of spinach, arugula, roasted sweet potatoes, lemony fennel and carrots, avocado and more. Amy Jennings knows how to throw veggies together and make a masterpiece. Re-heated roasted sweet potatoes and broccoli are combined with fresh avocado, arugula, tomatoes, pea shoots, hummus, seeds, nuts, lime and spices. Flavor overload in the best way possible! A mainstay staple for Carina Wolff? Kale! It’s her namesake after all. Add prepped ingredients (and some leftovers), such as tofu, sauteed mushrooms and onions, roasted red bell peppers, avocado and seasonings and you’ve got one well-balanced meal. Leftover turkey burger and roasted veggies? Make like Rachel Mansfield and whip together this power protein platter. Sprinkle crumbled turkey burger and roasted veggies over a bed of spinach and add half an avocado, digestive-friendly kimchi, hummus and your choice of lighter tortilla to make little wraps or dip in the hummus. Mansfield uses Siete Goods tortillas, a grain-free brand. Melissa Rifkin is on POINT with her methods for meal prep. Every Monday on Instagram, she shares a daily line-up for ingredients she’s prepared to mix and match her menu for the week. Here, Rifkin has a colorful- and protein-packed variety of asparagus, salmon, kale, tofu, brussels sprouts, falafel, bell peppers, zoodles and hard-boiled eggs.